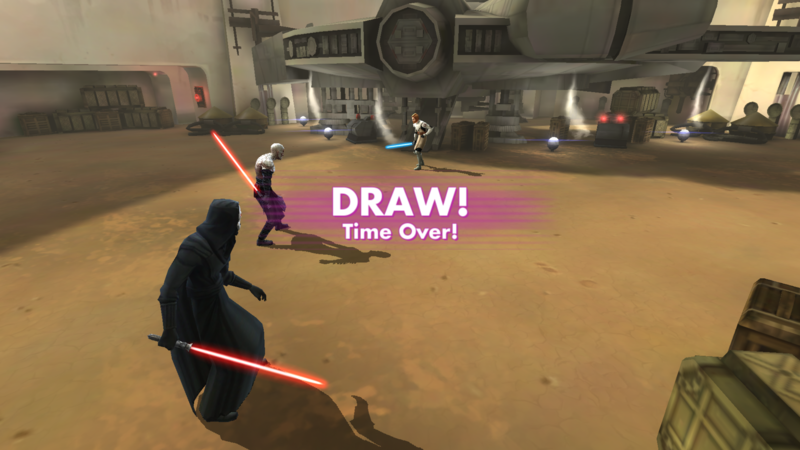 For the fact that Revan is really hard to beat, the time is always not enough for a completed battle. And can be seen from the picture, I gambled a battle with Revan trying to get to No.6 to No.4 at 17:55. Yeah I did have the situation under my control after I annihilated both Revan and Yoda. However, I lost my Traya and Thrawn. Then, with the endless 「foresee」provided by gk, there is no way for me to defeat the three remaining. When I finally kicked Bastila and Bindo, there is only 45s left. With the 4X, I failed to finished the battle in time and I lost. So ……is there any chance for the game to provide 8× and 16×? 8x will be great. I think 8x must be existed. However, not for Arena, I want it for Raids. hAAT Tank takes over 1 hour to clear w/ solo squad. Well.. Arena.. “8x” is also good but not like raids. It seems like the easiest way to settle this issue without allowing for ridiculous 10 minute matches is to give the win to whoever has the most characters left standing at the end. And if it's the same, highest total health/protection between all characters still standing. That seems a worthwhile idea. So if I enter battle kill one enemy and stop fighting until time runs out I win? Sounds like the biggest exploitable situation ever. It can never be based on anything but a clear to win. 1 idea would be, split the cost of a battle refresh over an addition 5 min. 10 crystals per minute. For up to 5 more minutes in a battle. Yes this could be used to lock in longer, but the person would be paying for it and would still have to acknowledge every minute extra yo keep it going. I like the idea of a 8x but I'm still torn that there is such a thing as a time out team and if you cant win in the prescribed timeframes it is a loss. If you idle for more than 30 seconds, game goes into auto and can't be switched off. Problem solved. Would also alleviate the "deliberately locking people into fights so they can't climb at payout time" issue, somewhat. I like the idea of an idle timer between moves if they wanted to address this. Keeping in mind this would stop everyone from clock blocking and lockouts in general. There have been numerous suggestions for increasing the speed even more, but I feel that even 4x misses some of the animations. Still exploitable, target random characters on the other side and make an action every 30 sec. Same situation as before. If you’re having problems with timeout (which is a viable strategy on defense), try using a Chewie team. Those matches are over in about a minute and a half, one way or another. The problem is you’re using a slow to win team against a slow to kill team. And before you ask, yes Chewie can beat both Traya and Revan on offense, just might be a little riskier against Revan. I mean, you could adjust the timer, and disable any controls if it runs out. I was just spitballing off the top of my head. The point is that this isn't an intractable problem. The question is whether the devs really care about timeouts and clock blocking enough to do anything about it. My guess is no. I would still like a member of the development team to comment on the bolded parenthetical above. They have gone to great lengths in the past to make sure that "time out" teams were NOT a viable strategy (at least not one encouraged by game mechanics). I would like to know if this is a change in philosophy or just the usual foot dragging.